This photograph was taken just after Tiffany and Dustin's first look on an old fisherman's dock on the Sprague family property in Cape Elizabeth. 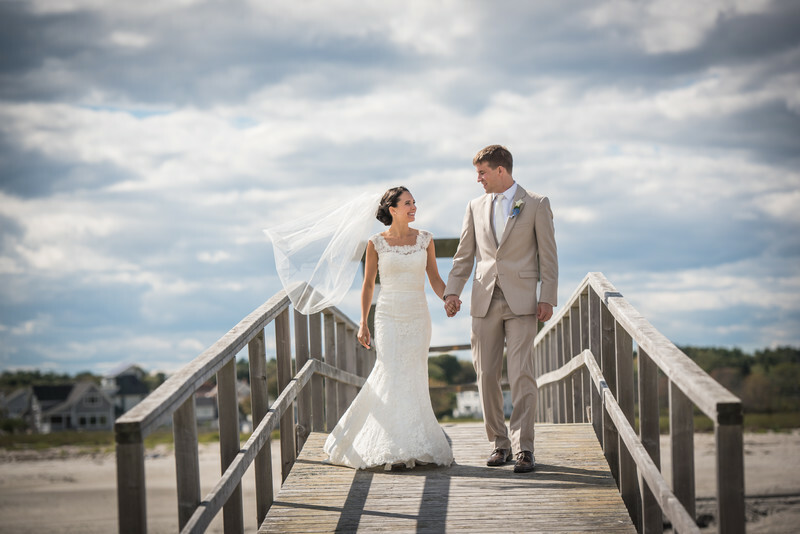 The dock overlooking Higgins beach was the perfect setting for the reveal and lead to this wonderful image of the two of them together ready to start the adventure of their wedding day. As a Maine wedding photographer I naturally gravitate to coastal images incorporating the sand and the sea. This wedding photograph is a small slice of their wedding day but a very important one. It highlights just them and their few moments together before the hustle and bustle of the wedding day starts. The rest is likely a blur as it all happens so fast... fortunately that's where the wedding photographer comes in! Preserving precious moment is what being a Maine wedding photographer is all about. Maine is the perfect backdrop for weddings of all kinds and as a Maine wedding photographer I love the diversity Maine has to offer. Location: Ram's Island Farm, Cape Elizabeth, ME. Keywords: cape elizabeth (45), Joshua Atticks Wedding Photography (249), Maine Farm Wedding (36), real maine wedding (24), Sprague (21).